Set 400 meters from the sandy beach, Apartments MM features spacious accommodation with balconies or terraces and sea views. Guests can have breakfast in the property’s traditional Montenegrian courtyard. All rooms and apartments of the MM guesthouse have a refrigerator and a private toilet. Some have shared bathroom facilities, others have a fully equipped kitchen with courtyard views. Wi-Fi access is free. Guests can use the common garden and barbecue facilities in the courtyard. The town Sveti Stefan is 2 km away and provides a range of restaurants and cafés. We have big apartment with 4 rooms (10 beds) and swimming pool. Or Apartments with 4, 3 and 2 beds without swimming pool and 2 rooms with 2 beds Parking is free of charge. For detail description, availability and prices, contact owner. www.svetistefanapartments.com In our family home, there are several different types of units that we have to offer to our guests. Each unit is air conditioned, has free internet access and cable TV. Units offer full equipped kitchen, bathroom with cosmetics (regularly cleaned and stocked). On your request we offer free laundry service, towel exchange, sun umbrella delivery and etc. Our house is situated opposite the island, Sveti Stefan. 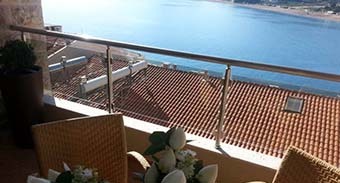 It is only 300 meters away from the island Sveti Stefan and the beach. 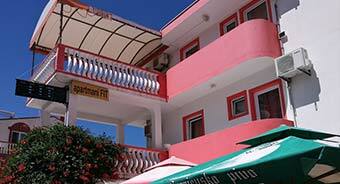 The apartment is located in a quiet village, near a supermarket and a restaurant. A free public parking and bus stops that connect us with Budva and Petrovac are just few meters away. City of Budva is only eight miles away. The city is more than 2,500 years old, and it is today's center of tourism in Montenegro. Furthermore, Budva is the center of cultural events, offers of entertainment, greengrocer, fishmonger, butcher shops, hypermarkets and night life. The hosts speak English, Russian, German and Italian. There is a possibility for providing transfer, going on picnics, rent-a-car service, fishing and hunting, school for diving and all other services if guests need them. In the suites of Niksha Radjenovic you will feel as if you were at home. Your hosts will be available for you 24 hours non-stop. We will welcome you with traditional sweets, home-made wine and brandy. Welcome! Studio 1 - 2+1 guests(35m2 + balcony 25 m2)Double bed + extra bed; completely equipped kitchen with dining room; bathroom with a shower cabin and a toilet. Two-Bedroom Apartment 3 - 4+1 guests (20m2+ a covered balcony-loggia) Two rooms, double bed + extra bed, other 2 separate beds, the kitchen and the dining room, completely equipped, the bathroom with a bath, toilet and a washing-machine, the loggia with a sitting set for 5 people. Two-Bedroom Apartment with Sea View 4 - 4+1 guests (45m2 + sea view balcony of 24 m2) Two rooms, double bed, the other room can be used as a sitting room, a single bed or a double bed, the dining room with an extra bed (a sofa), the separate kitchen completely equipped, the bathroom with a bath and a toilet. Comfort Two-Bedroom Apartment with Sea View 5 - 4+2 guests (60m2 + sea view balcony of 25 m2) Two rooms, a double bed, two separate beds, the separated kitchen with a dining room, completely equipped a couch in the sitting room as well as a smaller bed included, two bathrooms, one with a bath and a toilet and the other one with a shower cabin and a toilet. U okviru turističkog objekta Secret Garden su 16 novoopremljinih dvokrevetnih i četvorokrevetnih apartmana. Nalaze se u prvoj liniji, na svega dvadestak metara od plaže. Svaki ima dnevnu sobu, trpezariju, spavaću sobu, kuhinju , kupatilo i terasu. Veoma su funkcionalni i pružaju sve ono što vam je potrebno za prijatan i lagodan odmor ( TV, air-condition, sef, internet konekcija…). Takođe nam se možete obratiti za sve propratne sadržaje za koje ste zainteresovani ( oganizacija izleta, rent-a-car, rafting, krstarenje brodom…). Boravak u našim apartmanima, uz prijatan ambijent Svetog Stefana i tradicionalnu gosotljubivost, učiniće vaš odmor nezaboravnim! Dobro došli! Povoljna cijena - Sobe i Studija Tomi se nalaze na tihoj lokaciji u Svetom Stefanu, na samo 400 metara od plaže. Smeštaj je okružen vrtom sa mandarinama i maslinama. Nudi klimatizovan smeštaj sa balkonom ili terasom. Pogodnosti u svim smeštajnim jedinicama uključuju satelitsku televiziju i frižider. Sobe imaju kupatilo, dok studija sadrže takođe kuhinju. Gosti se mogu opustiti na nameštenim balkonima i terasama i uživati u pogledu na more. Sobe BOSE se nalaze u centru mjesta Sveti Stefan sa direktnim pogledom na more i čuveni grad hotel SVETI STEFAN. Sve sobe imaju svoja kupatila, opremljene su klima uređajima i imaju TV uređaj kao i zasebnu ili zajedničku terasu. Apartmani obala su smešteni u samom podnozju naselja Sveti Sefan, nalaze se na samo 30 m od plaze, pored blizine mora njihova prednost je i u tome sto su udaljeni od prometnih saobracajnica, okruzeni prirodnim zelenilom, a iznad njih se uzdize gusta borova suma. Nudimo Vam u potpunosti opremljene dvokrevetne, trokrevetne i cetvorokrevetne apartmane. Svi apartmani su klimatizovani, imaju kupatila, kuhinje, kablovsku TV i terase. Takođe vam je na raspolaganju besplatan parking. Apartmani su udaljeni 100m od restorana, 150m od marketa i autobuske stanice, 1,5 km od poste i ambulante. Dobro nam dosli! Coast Apartments are located in the foothills of the village Saint Sefan, there are only 30 m from the beach, near the vicinity to their advantage is the fact that the distance from busy roads, surrounded by natural vegetation, and above them rises a dense pine forest We offer fully equipped double, triple and four-bed apartments. 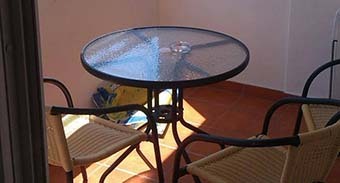 All apartments are air-conditioned, have bathrooms, kitchens, cable TV and terrace. Also, you can use the free parking. The apartments are located 100m from the restaurant, 150m from market and bus station, a 5 km from the post office and infirmary. Welcome!